Cancer in any form is a horrible disease, but oral cancer is perhaps one of the more insidious as it is often diagnosed so late in the day. The reason for this is that the early symptoms can be very easy to ignore or simply to miss and by the time you get a proper diagnosis then, unfortunately, it is quite likely to be at a later stage when treatment is more invasive and less effective. Around 43,000 people were diagnosed with oral cancer last year in the US and this can affect the mouth, right at the back of the mouth which is called the oropharynx, and the lips. For the last eight years this cancer has been on the increase so it is worth being aware of who is most at risk and the type of symptoms to look out for. Who Is More Likely to Develop Oral Cancer? There are two distinct risk factors for developing this cancer which include long-term use of alcohol and tobacco or being exposed to the human papillomavirus version 16, a virus that is responsible for most cervical cancers in women. However around 7% of people who have oral cancer do not have any identified cause and it is thought this could be due to some sort of genetic predisposition. Unfortunately oral cancer does have a very high death rate at around 43% from five years of diagnosis, but the good news is that if you are diagnosed in the early stages then this survival rate shoots up to between 80% and 90%. One of the most common signs of oral cancer is having a mouth sore that doesn’t heal after two or three weeks. You may notice changes to the skin in your mouth as it might thicken or become rougher in texture. This skin can also change color, becoming redder or whiter. As you can imagine, these signs are quite easy to miss so how can you protect yourself against developing this type of cancer? While living as healthily as possible will obviously make a difference, early diagnosis is vitally important. 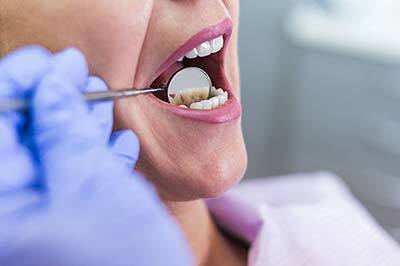 Who Can Diagnose Oral Cancer? Your family dentist is uniquely placed to identify the early signs of oral cancer and has received specialized training to look out for symptoms. It’s likely your dentist is the only health professional who regularly examines the inside of your mouth, and oral cancer checks will be part of your regular checkups. When you have your regular dental examination you might notice your dentist lifting your tongue out of the way so they can look underneath and they may even feel your neck to check your lymph glands. This is all part of a simple but thorough check to assess if you have any of the early signs of oral cancer and is just one more reason why those regular checkups are so important. In between checkups you can help yourself just by being aware of any changes to the inside of your mouth and through taking prompt action if you happen to have a mouth sore that doesn’t heal. It’s more than likely due to some other cause that can be easily put right but on the other hand prompt action could save your life. Do you have questions regarding oral cancer? Come to Century Medical and Dental Center (Downtown Brooklyn, Gravesend, and Flatbush) and speak with our best dentists in Brooklyn.